Neuroscientific research on emotion has developed dramatically over the past decade. 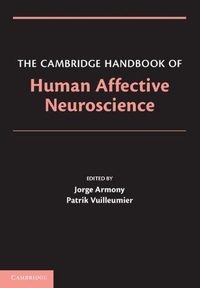 The cognitive neuroscience of human emotion, which has emerged as the new and thriving area of "affective neuroscience," is rapidly rendering existing overviews of the field obsolete. This handbook provides a comprehensive, up-to-date, and authoritative survey of knowledge and topics investigated in this cutting-edge field. It covers a range of topics, from face and voice perception to pain and music, as well as social behaviors and decision making. The book considers and interrogates multiple research methods, among them brain imaging and physiology measurements, as well as methods used to evaluate behavior and genetics. Editors Jorge Armony and Patrik Vuilleumier have enlisted well-known and active researchers from more than twenty institutions across three continents, bringing geographic as well as methodological breadth to the collection. This timely volume will become a key reference work for researchers and students in the growing field of neuroscience.